Buying software for your company can be a headache. If there aren’t ready-made solutions out there, developing one is often out of the pockets reach, and even more so if the company is pressed for time. Mobile apps offer a unique, but just as effective solution. By utilizing the tool that can already be found in a lot of your employee’s pockets (their smartphones), you can increase the efficiency of your projects exponentially. It can be overwhelming to find the perfect mobile software for your company. There are more options on the market than ever before, with fluctuating prices and different business models that may not always deliver what you want. There’s a lot of variety and innovation – but you still have to be careful. Snappii works a bit differently from other app-shops. Instead of building an app from scratch, we’ve developed a platform that allows us to put intricate (and simple) apps together in a fraction of the time. This means faster turn-around times, and extremely low prices. To see some more information about Snappii, check out our home page, or click here to send your requirements directly to sales. If you really are considering a construction application solution, here’s a few pointers to make sure you’re heading in the right direction. Why go through the trouble in the first place? Still, it’s a tough question. Perhaps you were just looking around and saw that a lot of competitors in your industry were converting to mobile solutions. Maybe you’re done with having file cabinets crowd up the office space and want to digitally index some of the paperwork. Or maybe you just want to keep track of your team. Personally, I think the best way to answer this is to remember who the app is for. Your team members are the ones that are going to be using the piece of software on a daily basis, so if anyone is going to give you accurate requirements on what exactly you need (and why you need it), it’s them. Do the field workers need voice dictation so that they don’t get slowed down by having to type? Do your data-entry people want a system that sends forms to a cloud? Write down everything you can get. Each app builder is going to do things a bit different, so determining what you want you app to accomplish can help with the next part. Before you even start your search, your idea has to be slightly fleshed out. Sure, you may have this list of requirements, but what then? Even a professional app shop would ask what you expect from your completed app. Map out what type of utility you want the app to have, what type of function employees will be able to do with it and, of course, your budget. Although Snappii is usually pretty lenient when it comes to requirements, even we need a sort of baseline of what you, as the consumer, expects. One thing to keep in mind too is something many overlook: ease of use. The purpose of converting your team to a digital solution is to alleviate some of the burden that goes into doing daily tasks like report logs. If the process of using the app is more difficult than finding a pen and paper, then it probably isn’t going to work out for neither you nor your employees. The more concrete your list of requirements is, the easier it will be to find an app builder that works for you. 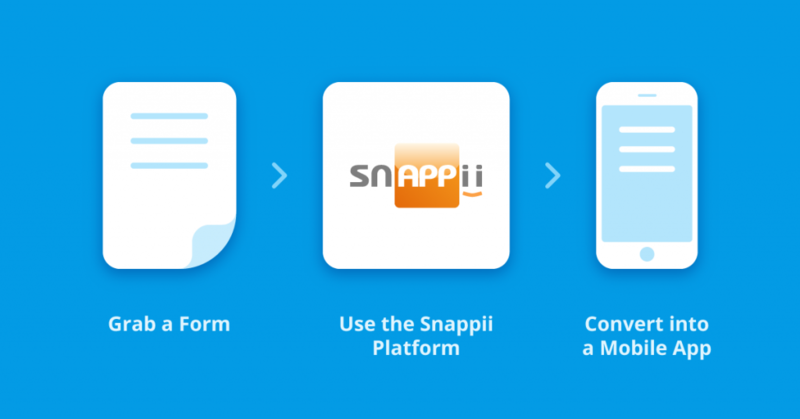 In most cases, at least with Snappii, our apps revolve around a single form or two. Making something extravagant and complicated isn’t the goal, and it’ll help with keeping the cost of things to a minimum. It’s inevitable that during the first few weeks of converting from paper to digital, something is going to go wrong. When that happens, you want a support system there to help you with getting out of trouble. If the app shop that you’re investigating has a support hotline, call it and see if you like what you hear. Take notes on whether the support is 24/7, English-speaking and actually helpful. It may not seem like a deal breaker at first, but even the most sophisticated systems can have problems at times, and you don’t want your workflow to be at a standstill because of something that was supposed to make the job easier. These are just a few tips to get your feet wet about the entire process of converting over to mobile forms. For every company, things will be different. Snappii, a leader in mobile software technologies, is dedicated to helping you see your vision come true. With our industry defining mobile form creator, platform, and the ability to customize every aspect of your app, our team can provide a solution to you in less time and with less money than you can imagine. Click here to try out some of Snappii’s templates.